Someone, somewhere asked a good question about Lightroom. How would you wow a mixed group of existing users and other photographers when you’re allowed just 20 minutes? 20 minutes? At most? Without anyone asking you anything? Up the right panel in a couple of parkour leaps. Keywording is there, templates too. For now, that’s all the Library they can take. Move on. 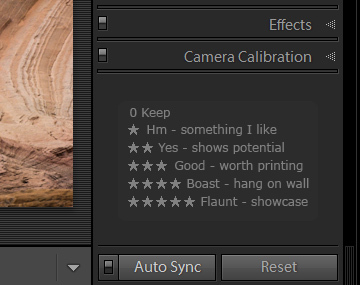 Stress again that Lightroom’s raison d’etre is handling pictures, plural, while Photoshop is for the singular. But – careless me – one picture shouldn’t have been selected and the spot correction goes wrong. Work in Auto Sync all the time, or never – don’t keep switching. I bet that surprises some folk reading this! Of course, include standard message about never paying for presets…. In 20 minutes that’s about as much as I can pack in. And if that doesn’t leave their heads spinning…. After first posting these thoughts, I was asked – a little mischievously – why I don’t say more about Slideshow, Web, Map, Book and Print. A single word each? That good then? Well, quite the contrary. I am not trying to pack every feature into a short presentation. The audience – existing Lightroom users and those questioning their current working practices – already know and take for granted that they can create impressive slideshows, web galleries, and prints etc, just like they don’t need showing exactly how you add keywords or adjust image brightness. Such features slip into the presentation “en passant”. Instead it’s a 20 minute wow – bullet points to highlight great tools people may have overlooked or forgotten, and to distinguish Lightroom from Photoshop and other programs they may know. So my emphasis is on Lightroom for handling pictures – plural – and after waking up any Aperture users by showing how Lightroom lets you see where your pictures are located, I then unleash AutoSync on them. All users should be able to appreciate the huge productivity gains it offers, and extolling AutoSync often shakes up existing Lightroom users who have seen that most other Lightroom authors are dumb things down and advise against its use. By contrast, I advocate it. It’s a great feature and to my mind it should have been the default behaviour – and not even optional. 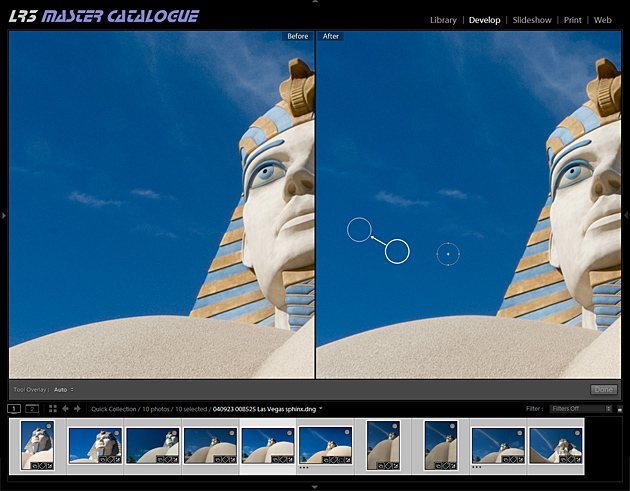 Similarly, people forget some of Lightroom’s cleverest features. The targeted adjustment tool is that little grey spot in the panel corner and is so easy to overlook. Yet this innovative tool lets you keep your eyes firmly on the image ‘s changing appearance, not on sliders, which almost inevitably results in a final image that better expresses the picture’s qualities. Split Screen view is almost unique to Lightroom, while History isn’t just some glorified Undo like in Photoshop but provides a way to benchmark your fine tuning by dragging and dropping steps to the Before side of the screen. You can quickly show how Before/After and History are more than the sum of their parts. In short, if you’re not given much time to convince, would you show things they know Lightroom can do – or would you want to hit them with a bit of shock and awe? That’s what I think the above bullet points deliver.